Infused with natural light, the Van Gogh Musuem (VGM) has a jaw-dropping collection on view. I was reminded of the MoMA (home of The Starry Night and several other masterpieces by Van Gogh), and was impressed by the breadth of the VGM's collection and the lightness of its gallery space. In this post, I'll look at two paintings that can be found on the second floor. But of course there are many more that deserve our attention and admiration. The Potato Eaters (1885) marked one of the first times Van Gogh attempted a masterpiece. As an undergraduate student, I wrote an Art History paper on it. I can only imagine I was drawn to the artist's documentary approach in terms of depicting the lives of peasants. Here, five peasants sit at a table eating a modest meal. Their lumpy hands and faces indicate the labour of their work. 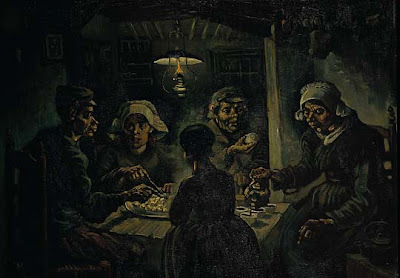 Van Gogh says he chose a dark colour palate that resembles the dusty, brown earth from which they gather their potatoes. Ultimately, he was successful in creating an uneasy, apprehensive mood in this scene. Wheatfield with Crows (1890) is often regarded as Van Gogh's last painting. But I should note that this is not documented. In the painting, Van Gogh depicts a golden wheat field with three paths going in different directions while menacing black crows fly overhead. The sky is an eye-catching blue but looks threatening. It's often said this painting shows the artist's troubled state of mind. I was struck by Van Gogh's use of vivid yellows and blues applied with expressive thick brush strokes. And indeed the pure black crows are a foreboding presence, as I can almost hear them cawing and flapping their wings.